Combining passions for music and local produce with Sydney's never-ending burger love affair. Burgers, hip-hop and ethically-sourced produce collide at Alexandria's newest eatery. 4 Ounces is the creation of head chef Rory Donnelley (ex-Cafe del Mar) and his childhood friend Mitch Coleman, who have combined their passions for music and local produce with Sydney's never-ending burger love affair. "We've both been in the graffiti and hip hop scenes for ages, plus I've been working in fine dining for 13 years," says Donnelley. "I wanted to bring the values of those kitchens into fast food." That means mondo burgers made with premium produce and out-of-the-ordinary flavour combos, all named after hip-hop legends. Take The Ol' Dirty, for example, which is a glazed donut bun stuffed with two special blend patties, American cheese, Westmont pickle, maple bacon and house sauce. For veggos, there's The ASAP: smoked tofu, deep-fried truffle mac and cheese, wild mushrooms, Westmont pickle, liquid cheese and house sauce on a milk bun. They've got burgers on bagels, southern fried chicken burgers and loaded fries, all piled high in that over-the-top, sloppy comfort food way. Plus, for those after a sweet kind of bur fix, soft serve burgers comprise 4 Ounces' dessert menu. 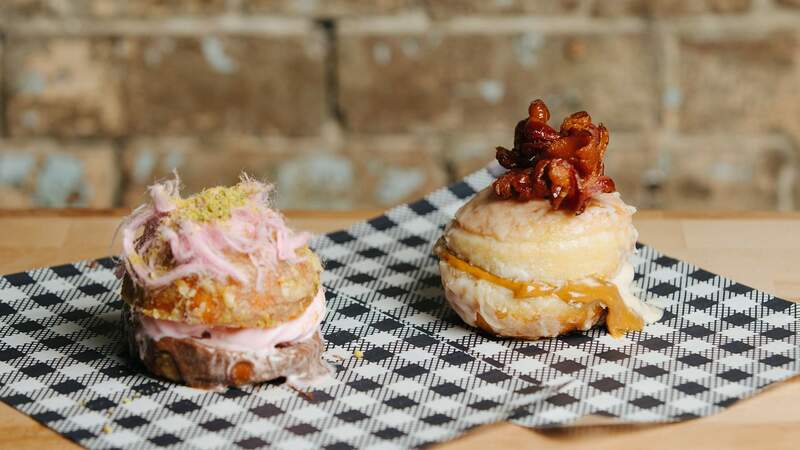 Made with Bellingen Gelato and Donut Papi's finest, the range rotates monthly, but with peanut butter and Dulche de Leche with maple glazed donut and candied bacon one of the first flavours — and Turkish delight gelato with pistachio glazed donut and pashmak too — it's safe to say that there's nothing standard about these ice cream creations. And this comfort food even comes guilt free. "80% of the produce comes from within a 300 kilometre radius of Sydney," says Donnelley. The buns are from Marrickville's Bread and Butter Project; the organic, free-range chicken from Feather and Bone; and the beef from Hereford Red, Orange. The drinks menu similarly keeps it local — think wines from Phillip Shaw, beers from Philter and Grifter and spirits from Archie Rose and Poor Tom's. There's seating for about 20 inside and 30 outside, with the casual fitout featuring simple white tiles and timber. This puts the focus on the street art covering one wall: a mural by James Jirat Patradoon. "We wanted to open a place that represented our friends and family, where we knew they could come and have a good time," Donnelley said. Whether Sydney needs another burger joint, or another hip-hop joint, is certainly up for discussion, but we can appreciate the ethical slant to this one. 4 Ounces is now open at 38 Mitchell Rd, Alexandria. Open Sunday through Thursday from noon to 10pm Friday through Saturday from noon until midnight.